This fantastic T-shaped modular office wall is crafted from select hardwood solids and oak veneers finished in a warm Chestnut Brown. With multiple work surfaces and myriad storage capabilities, the unit is ideal for a shared home office or for the self-employed. The unit consists of a modular 32" desk, a drawer/file, two door hutches, one open hutch, a partner's desk and a rolling file drawer. 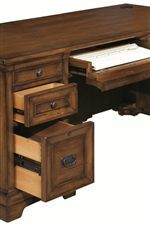 Storage and functionality features include an integrated keyboard tray with a document tray, built-in AC outlets and USB connections, a pullout laptop tray that can be used on either side of the partner’s desk, five utility drawers, two locking file drawer for letter or legal size files, eleven adjustable shelves and four hutch doors for storage and display. This modular wall office is an attractive, versatile and functional option for outfitting your home with a quality, professional caliber work environment. The Centennial Modular Wall Office with Computer Desk and Partner's Desk by Aspenhome from Bullard Furniture. We proudly serve the Fayetteville, NC area. Product availability may vary. Contact us for the most current availability on this product. I49-344-2 Partner's Desk Top & End Panel 1 59.75" 32" 31"
I49-342-2 Door Hutch 1 32" 14" 47.75"
I49-340-2 Modular 32-Inch Computer Desk 1 32" 23.875" 31"
I49-343-2 Open Hutch 1 32" 14" 47.75"
I49-345-2 Partner's Desk Base 1 32" 23.875" 31"
I49-341D-2 32-Inch Drawer/File Unit 1 32" 23.875" 31"
I49-346-2 Rolling File 1 18.75" 22.25" 24.25"
The Centennial collection presents a stylish set of traditional home furniture pieces for the master bedroom and home office. 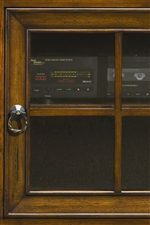 Rich oak veneers are warmly finished in a medium brown Chestnut stain that is further enhanced by touch lighting, faceted panels, and antiqued metal hardware. Bring elegance to your home with designs that are sophisticated, yet tech savvy and real life-driven for the way people live and work in contemporary homes. Clever cord management, innovative storage solutions and lots of hidden features clearly demonstrate the benefits that this collection has to offer. With a variety of items available for several major rooms in the home, and modular office pieces that can be configured to accommodate the size and style that you are looking for, finding and integrating the perfect design is easy. Bring the Centennial collection into your home today, and enjoy these innovative features in beautiful traditional design. 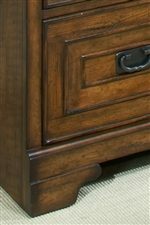 The Centennial collection is a great option if you are looking for Traditional furniture in the Fayetteville, NC area.